Geochemists at Rensselaer Polytechnic Institute are challenging commonly held ideas about how gases are expelled from the Earth. Their theory, which is described in the Sept. 20 issue of the journal Nature, could change the way scientists view the formation of Earth’s atmosphere and those of our distant neighbors, Mars and Venus. Their data throw into doubt the timing and mechanism of atmospheric formation on terrestrial plants. Lead by E. Bruce Watson, Institute Professor of Science at Rensselaer, the team has found strong evidence that argon atoms are tenaciously bound in the minerals of Earth’s mantle and move through these minerals at a much slower rate than previously thought. In fact, they found that even volcanic activity is unlikely to dislodge argon atoms from their resting places within the mantle. This is in direct contrast to widely held theories on how gases moved through early Earth to form our atmosphere and oceans, according to Watson. Scientists believe that shortly after Earth was formed, it had a glowing surface of molten rock extending down hundreds of miles. As that surface cooled, a rigid crust was produced near the surface and solidified slowly downward to complete the now-solid planet. 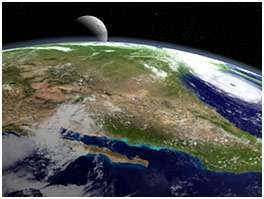 Some scientists have suggested that Earth lost all of its initial gases, either during the molten stage or as a consequence of a massive collision, and that the catastrophically expelled gases formed our early atmosphere and oceans. Others contend that this early “degassing” was incomplete, and that primordial gases still remain sequestered at great depth to this day. Watson’s new results support this latter theory. Argon and other noble gases are tracer elements for scientists because they are very stable and do not change over time, although certain isotopes accumulate through radioactive decay. Unlike more promiscuous elements such as carbon and oxygen, which are constantly bonding and reacting with other elements, reliable argon and her sister noble gases (helium, neon, krypton, and xenon) remain virtually unchanged through the ages. Its steady personality makes argon an ideal marker for understanding the dynamics of Earth’s interior. “By measuring the behavior of argon in minerals, we can begin to retrace the formation of Earth’s atmosphere and understand how and if complete degassing has occurred,” Watson explained. The team heated magnesium silicate minerals found in Earth’s mantle, which is the region of Earth sandwiched between the upper crust and the central core, in an argon atmosphere. They used high temperature to simulate the intense heat deep within the Earth to see whether and how fast the argon atoms moved into the minerals. Argon was taken up by the minerals in unexpectedly large quantities, but at a slow rate. But there is some argon in our atmosphere--slightly less than 1 percent. If it didn’t shoot through the rocky mantle, how did it get into the atmosphere"
And what about the primordial argon that was trapped in the Earth billions of years ago" “Some of it is probably still down there,” Watson said. Because Mars and Venus have mantle materials similar to those found on Earth, the theory could be key for understanding their atmospheres as well. Watson and his team have already begun to test their theories on other noble gases, and they foresee similar results. “We may need to start reassessing our basic thinking on how the atmosphere and other large-scale systems were formed,” he said.